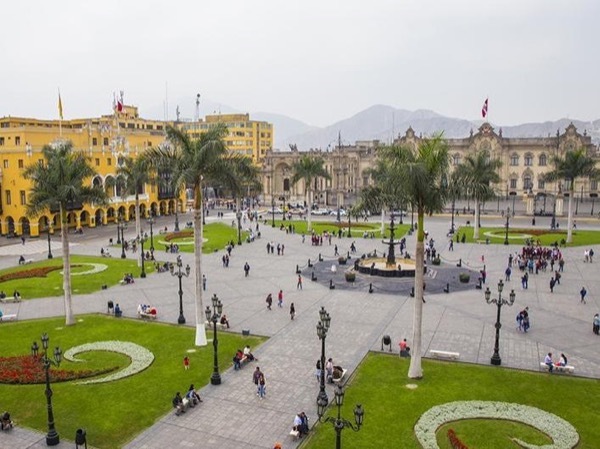 Traveler Reviews for Private Tour in Lima, Lima, Peru by Tour Guide Abel P.
About Abel P. Message Abel P.
Abel did a fantastic job taking us to all the best sites in Lima. His English was perfect and he explained much about the history and customs of Peru. He also took us to a nice restaurant for a traditional Peruvian lunch. We would highly recommend him as a tour guide. What a great time in Lima! Abel showed us in several hours what would have taken us days to do on our own and is a wealth of information about historical and modern day Perú. He catered the tour to our likes and was funny too! TOUR GUIDE RESPONSE: Thank you guys. It was great to meet you. Abel was nice and informative. A nice way to see Lima. Abel provide an excellent overview of Lima - the history, architecture, culture and current environment. It was money and time well spent. I wouldn't hesitate working with him again should my travels find me back in Lima. TOUR GUIDE RESPONSE: Thank you Tom, it was very nice to having met you. He was great. Very knowledgeable about current and historical events in Lima. We covered so much territory. We never could have seen as much in one day on our own. He took us to a nice lunch buffet with Peruvian food which gave us an opportunity to sample a lot of different foods. TOUR GUIDE RESPONSE: I also had a wonderful time with you guys. I'm glad you liked Lima. Abel was terrific!! Knowledgeable, enthusiastic, flexible to our needs and interests, all with a good sense of humor. We look forward to working with him again and encourage others to do so as well. Abel was INCREDIBLE! We hired him for 2 days while in Lima. First of all, his English is perfect. Second, his knowledge of Lima and the Pachacamac ruins was also perfect. We had a group of 8 and he was extremely attentive to our needs. I would HIGHLY RECOMMEND him, without reservation. Los Ficus, Casa Hacienda, Was worth the entire day. Abel was an excellent guide. TOUR GUIDE RESPONSE: I know sir, the Casa Hacienda Los Ficus is such an amazing and quite place, that's great to know you guys loved it and the food. Abel is knowledgeable and personably and completely fluent in English. We had heard from our host family about the food market and Abel managed to adjust our tour to include a wonderful experience there. We are so glad we chose a customized tour because it exceeded our expectations! Highly recommend! Excellent Tour, Abel is very knowledgeable of the Lima and was a great Guide. TOUR GUIDE RESPONSE: Thank you very much sir. It was great to meet you. Abel was enthusiastic, knowledgeable and extremely chrasmatic. He really knows his history, architecture and, of course, his culture. We lunched at an excellent Peruvian restaurant and the food was delicious. We were looking for a particular type of souvenir. Abel, went out of his way to bring us to a shop that he thought might sell it. We could not be more pleased with him and would heartily recommend him. Thank you. TOUR GUIDE RESPONSE: Thank you guys. It was so great to meet you. I appreaciate all your comments. Great tour- well though through...adjusted schedule around traffic and our needs. Very well versed for areas of town. Would recommend. Abel is delightful! He took my daughter on a tour of the city and was very fun and knowledgeable. She could not praise him enough! I'm so glad she got the chance to see the city with a local who is kind and trustworthy. Abel was very knowledgeable about Lima and it's history. He showed his love for his country in many ways. We enjoyed our time with him. We were able to see so much of Lima due to Abel organization of our tour. He took very good care of us. Everyone should be so lucky to have Abel as a guide. Abel was waiting for us at one in the morning. He and his driver gave us a very safe drive to our hotel. Superb tour of Lima! Abel's English is excellent! Exceeded expectations. I speak fluent Spanish, but the other 3 in my party did not. In these situations, usually I end up being the translator/tour guide, because the "bilingual" guide cannot communicate well. But with Abel, I just relaxed and enjoyed his in-depth explanations of amazing sights and experiences. The ride was comfortable, the sites were well chosen, and we had a great time. He earned our trust and admiration. TOUR GUIDE RESPONSE: Thank you very much. It's so nice of you guys. I also had a great time with you. As I told you the day of the tour you guys are fantastic people. Cheers.